I have the best husband ever. He is thoughtful, loving, dedicated, loyal, witty, and pretty darn charming. He has always been those things, but this weekend was the icing on the cake. Today was my birthday and he wanted to make me feel extra spoiled. And he did just that by planning an entire weekend for me. On Saturday we spent a wonderful day together as a family with a long walk to the wharf. Gwendolyn loved looking at the seagulls and the trees and having races with Daddy. Later I got to go to a massage that Bill scheduled for me and then arrived home to jazz music, Champagne, a cheese platter, and strict instructions not to lift a finger. Gwendolyn was very pleased with her portion of the proceedings and made sure I knew she helped. After some sips and nibbles together, Bill put Gwendolyn to bed and then slaved away in the kitchen preparing a surprise dinner. He was so nervous and so thoughtful in all of his preparations. How does this sound? 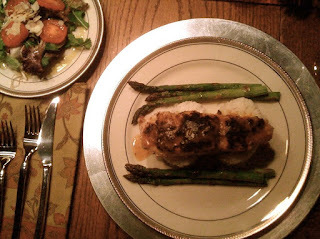 -- A Pineapple, Mango, Coconut Glaze lightly drizzled over Macadamia Nut Crusted Mahi Mahi on a bed of Sticky Rice with Roasted Asparagus and a Fresh Green Salad on the side. And it tasted phenomenal! I couldn't believe it. Not only was the presentation gourmet, it tasted it, too!!! Bill then insisted that I turn in early and sleep in late. He did all the things I usually do at night and still got up at his usual 6 am. How awesome is all that? Then today we took a nice drive out to the wine country to Foxen Winery. I was so thrilled that it was not crowded because that meant we could actually go in and do a tasting. 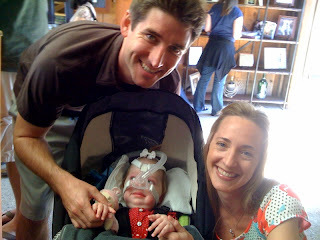 Gwendolyn enjoyed cheers-ing and we enjoyed the fantastic wine. Afterward we headed over to a different area and had a leisurely picnic under big oak trees and sung endless rounds of "Old MacDonald" -- one of Gwendolyn's go-to favorites. I feel rejuvenated and so, so thankful that I have such an amazing partner. A very special birthday indeed. Thank you sweetheart.